The leg press is an effective leg exercise. There are many different versions of the leg press machine, and they are all similar. 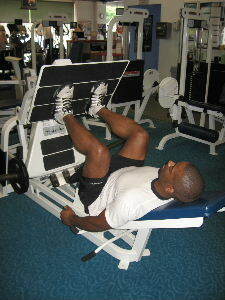 Every leg press will work the quadriceps, hamstrings, glutes, and calf muscles. Depending on the shape and design of the leg press that you are using, you'll get a slightly different emphasis on all of the leg muscles. The angles of the hips and knees are the biggest differences in design. The hamstrings and glutes work on the hips and the quadriceps work on the knee. Greater hip motion equally more emphasis on the glutes and hamstrings, and greater knee motion equals more emphasis on the quadriceps. The reclined leg press generally places a little more emphasis on the glutes and hamstrings when compared with a horizontal leg press. Starting Position: Position yourself comfortably in the leg press machine. Place your feet parallel to each other with your toes point straight ahead. Keep good alignment between your ankles, knees, and hips. Form: Exhale and press your legs forward until your knees are straight, without hyper extending your knees. Hold for a brief second at the top and then slowly return to the starting position. Personal Trainer Tips: move in a slow and controlled manner, and be careful not to lock or hyper extend your knees. When your legs are weak, the tendency is to allow your knees to cave in during this exercise. Focus on keeping good alignment in your lower body during this exercise. Pushing through the toes, places a little extra stress on the knee joint. Focus on pressing through the heels and the ball of the foot. 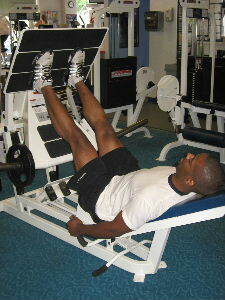 The leg press is an efficient exercise because it works multiple muscles at one time. I am a big fan of multi-joint leg exercises because they are more functional than machines that isolate one muscle at a time. If you're doing a leg workout only with machines, the leg press should be one of them.